This book provides a commentary on the most important remains of several of the key poets of the Athenian Middle Comedy. A major asset of this book is the Introduction, where the author discusses two controversial issues; the periodisation of Greek Comedy and the validity of the term Middle Comedy itself. The Introduction also deals with the issue of the sources for the comic remains and their reliability. The rest of the book is divided into six sections, each devoted to one of six major Middle Comedy playwrights respectively. For each fragment a critical apparatus, a translation and a commentary are provided. The commentary for every fragment is meticulous and thorough, enriched with cross-references to parallels, in the form of either antecedents or precedents, both from within Greek Comedy and from other genres. The commentary is primarily literary; however, wherever the different readings affect the meaning textual issues are also discussed and at times new readings are proposed. 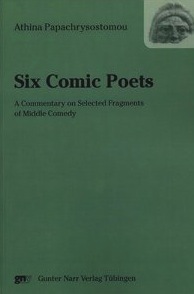 The comprehensive analysis of individual fragments is intended to help the reader to understand both the work of the individual poets and the nature of Middle Comedy. As well as demonstrating that the first half of the fourth century is an epoch of extreme experimentation, the commentary also illustrates the complex process of innovation and continuity which characterises Athenian Comedy over two centuries. Read the review by Leonardo Fiorentini on BMCR (2010.02.39).